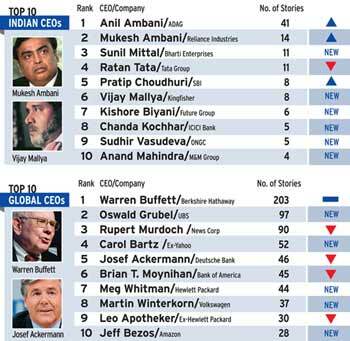 Anil Ambani of ADAG topped the list of mostdiscussed CEOs. 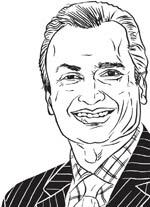 The news about the three executives of ADAG arrested in the 2G scam denying any wrongdoing generated much media interest, as that raised the possibility of the Central Bureau of Investigation, or CBI, extending the probe dragnet to Ambani himself. A news flash from a reputed wire agency announcing a CBI clean chit to Ambani in the Swan deal, as well as the news of the stock prices of some ADAG companies rising in its wake, and the subsequent denial of any clean chit by the CBI, were all widely reported in the media. ICICI Bank chief Chanda Kochhar was the most favourably reported CEO, thanks to an article in Fortune extolling her leadership that was reprinted extensively in the local media, as well as her becoming the first woman to get the ET Biz Leader Award.